(CNN) -- Intelligence sources say Osama bin Laden first focused on Southeast Asia in 1988 when he sent his brother-in-law Mohammed Jamal Khalifa to set up a financial network in the region. Officials say they believe much of that network is still in place today. Then starting in early 1994, several cells of expert terrorists, mainly Arab Afghans, intelligence sources told me, arrived in the Philippines and established operational cells all over the country. Over the years, al Qaeda jumped from there to Malaysia and the rest of Southeast Asia. Every single major al Qaeda plot has some link to Southeast Asia. •Following the 1993 attack on the World Trade Center, its mastermind, Ramzi Yousef, fled to the Philippines. •The 1995 plot to bomb American planes, which aimed to kill 4,000 people over 48 hours, was hatched in Manila by Youseff and his uncle, Khalid Sheikh Mohammed. •In the 1998 U.S. embassy bombings in East Africa, one of those convicted did some of the planning for the attacks from the Philippines. •The bombing of the USS Cole in 2000 was partly planned in Malaysia. •And the attacks on September 11 had a key link to Southeast Asia in the shape of Khalid Shaikh Mohammed, now one of the world's most wanted men. In the mid-90's, Mohammed lived in Malaysia and the Philippines, where investigators remember him as someone posing as a wealthy Saudi sheikh. Today the U.S. is offering a $25 million reward for Mohammed's capture with the only two pictures of him known to exist posted on the Internet on the FBI's Most Wanted Terrorist list. In 1995, Colonel Rodolfo Mendoza, then head of Philippine counter terrorist operations, lead a surveillance operation keeping tabs on him. "He is educated, he can speak fluent English," says Mendoza. "I think he has some skills in flying and also scuba diving." But after his cell was busted in the Philippines, Mohammed was able to elude Mendoza and find his way to Afghanistan. Eventually, he rose in al Qaeda's ranks to become a trusted bin Laden lieutenant and, by his own admission, one of the key planners for 9/11. Investigators say that in 1999, Mohammed met with one group of September 11 hijackers in Germany, and a few months later, the second group in Malaysia. Another plot came to fruition after September 11 with the truck bombing of a Tunisian synagogue last April which killed 19 people. German officials say three hours before the attack, the man suspected of carrying out the attack made a telephone call to Mohammed. Intelligence officials say that just like Hambali, Khalid Sheik Mohammed has been busy setting up networks and plots across Southeast Asia. They say that just one day before 9/11, he sent Kuwaiti-born aide Mohammed Mansour Jabarah to activate sleeper cells in the region. Twenty years old and holding Canadian nationality, Jabarah's links go to the top. Shortly before he left for Asia, he met with Osama Bin Laden. "Jabarah, a personal choice of Osama bin Laden because of his mastery of the English language, was dispatched on 10 September 2001 by al Qaeda operations officer, Khalid Shaikh Mohammed, to assist in carrying out bombing activities in the Philippines and Singapore." More evidence in the form of a videotape found in the home of al Qaeda's former military chief, Mohammed Atef, gives an idea of just what was being planned. Singaporean authorities say it is a surveillance tape made by al Qaeda members planning to attack the U.S. Embassy and other Western targets in Singapore. 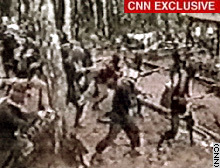 The plot was part of a larger plan to hit other Western targets across Southeast Asia, including Malaysia and Indonesia. Intelligence sources say support cells in these countries were to lay the groundwork and shortly before the planned attack suicide bombers from outside the region would arrive to carry out the truck bombings. Al Qaeda expert Rohan Gunaratna says this support base has had a critical "force-multiplier effect" for the group's operations in Southeast Asia. "When al Qaeda operates in Southeast Asia through Southeast Asian organizations, it has protection, it has resources," he says. Jabarah, regional intelligence officials say, worked with Indonesian explosives expert Fathur Roman Al-Ghozi, now in custody in the Philippines. He was working with another group that intelligence officials say was co-opted by al Qaeda, the Philippines Moro Islamic Liberation Front. The two men were with members of the JI cell in Singapore when they made the surveillance tape of potential U.S. and Western targets. According to members of the JI cell in Singapore, Al-Ghozi and Jabarah told them to acquire 21 tons of explosives to be used for the suicide bombing attacks. Based on information from Singapore, Philippine authorities arrested Al-Ghozi last January. Information from him led them to 1.2 tons of TNT slated, officials in the Philippines say, for Singapore. They say they believe another 4.6 tons of explosives are missing and may be in the hands of JI. Jabarah was arrested in Oman last March and is now in U.S. custody. According to an FBI document shown to CNN, Jabarah worked closely with Hambali and another al Qaeda operative now also in US custody, Omar al-Faruq. It was information from al-Faruq that verified Jabarah's statements and pushed the U.S. to raise its global terror alert warning to orange on September 10 this year. The truck bomb attacks, al-Faruq told the CIA, could be activated on the anniversary of September 11 -- or any time security forces let their guards down. "The actions show that there is danger out there," says Ralph Boyce, U.S. ambassador to Indonesia. "The war on terror continues, and that the treats are serious." Since then, aside from targeting U.S. and Western interests, al Qaeda has been developing a new tactic to hit what intelligence officials call "soft targets" -- places with little or no security. Jabarah told his FBI interrogators that Hambali was planning to "conduct small bombings in bars, cafes or nightclubs frequented by Westerners in Thailand, Malaysia, Singapore, the Philippines and Indonesia." That information, intelligence sources say, was passed to U.S. allies and may have contributed to recent actions and advisory warnings in the region. So could Bali have been prevented? Virtually impossible, analysts say, since Indonesia was in denial about al Qaeda's existence in the country. Also, officials in the U.S., Australia and across the region say it's difficult to pinpoint specific targets from what they call intelligence chatter. What can be done and what sort of response authorities can give is the focus of the final part of our analysis.